I was at the dentist for a regular cleaning and the hygienist asked me if I had noticed anything wrong with my teeth since the last time I was there. “Well,” I said, “this one molar in the back seems a little sharp.” When the dentist came in he took a look and told me that I had broken off the back of the filling. He said I was probably grinding my teeth at night. (It’s his thing, he always tells me this at least three times a visit.) I got it fixed a couple weeks later and promptly broke it again in under an hour. I figured this out by looking in the mirror and checking out my molar. It’s the first time I’ve actually examined my teeth in years. I had never thought to do this before. I’ve always felt around but never could really tell what was going on in there. Once I used my eyes instead of my tongue I understood why the dentist knew so quickly that I had broken the filling. It was clear as day. Grapefruit peels aren’t the first thing that come to mind when I think of sophisticated desserts but as you can see from the photo at the top that after a little time boiling in sugar syrup and a dip in chocolate they dress up pretty well. Who’s looked at a pile of peels and thought “Hey, I bet that would make a fancy treat” ? It wasn’t me. I had a bag full of fresh grapefruit that a friend brought back from Thanksgiving in Scottsdale. As usual, Google got me pointed in an interesting direction. I used this recipe from Jacques ‘Mr. 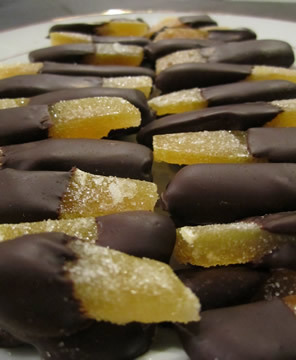 Chocolate’ Torres to deal with my citrus windfall. Like my dentist who looked at my teeth and knew right away what was needed, an experienced pastry chef can view the world through the lens of confection and see exactly what an astringent grapefruit peel needs to become a delicacy. Now I have a container of grapefruit infused syrup that I’m going to use to make candied ginger. You should. My wife and daughter think they taste too strong but I like them plus they make good gifts for cheap. Wow, beautiful (nice pic!!). I hope I get to try one…. 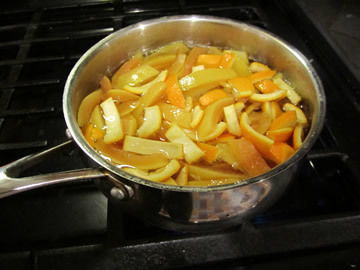 : ) I bet the left over syrup would make a good base for marmalade, too. And now that I’ve tried them (thanks Michael!! ), I can attest that they are indeed delectable. Yum yum!!! The top photo took me back 60-plus years! 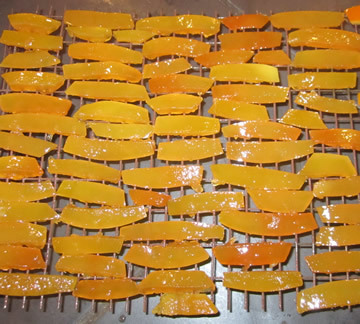 My grandmother (your mother’s mother’s mother) used to make candied grapefruit peel every Christmas. I can’t recall whether hers were dipped in chocolate or not — I kinda think not — but at the same time she also made another confection that I really grooved on: same general size but made from almond paste (somehow stiffened a bit? ), colored green, and half-dipped in dark, bitter chocolate. Amazing! I remember these two candies always being served together after dinner, when I was already too full to eat more than one or two. The contrast between the VERY sweet almond paste and the unsweetened (or so it seemed to me) chocolate was amazing. Your goodies work the other way around, I think: acidic (though sugared) peels and sweetened dark chocolate, no?